Located in a small french village just outside of Ruffec, Chez Sophie enjoys a unique village location walking distance to small amenities in this village. In charente stone the house enjoys all the amenities you require for a relaxed french holiday. Supermarkets and more shopping are 10 minutes drive away. Poitiers airport is a 40 minute drive. Enjoy day trips with close proximity to Cognac, Angouleme and surrounding beaux villages, e.g. Verteuil sur Charente. We are a family that enjoys travelling and comes from the UK and New Zealand. We love rural France and our house is located in a lovely village with good amenities. There are some gorgeous restaurants, chateaux and other french sites in close proximity. 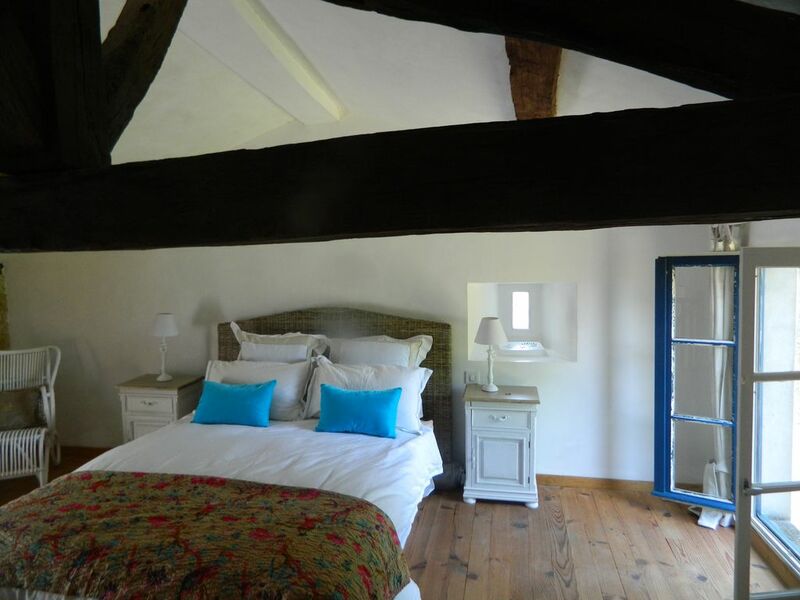 We love the house as it is located right in a village and still has original French charm. a small car can fit inside the gates, however parking outside the gate is fine. There is no coffee maker however there are coffee plungers and stove top coffee pot. suitable for 4 adults, can use outdoor chairs if needed. river canoe on the Charente is close by. We arrived at Chez Sophie at 8pm on a Saturday evening to find not only a beautiful gite but also bread, butter, cheese and wine plus jam, pickles etc left in the fridge. So we felt at home straight away. We also had our two dogs with us and they loved the place especially the huge garden. My husband can’t sleep on a hard bed but he had no problems on the bed here it was so comfy! The village was quiet but had all the essentials, bakery, where we bought our pain au chocolate most mornings. It also had a great butcher, bar restaurant, post office and corner shop, we used all of these. We found another bar restaurant nearby called Auberge d Noyer, run by 2 English guys, Steve and Sean, the food was fantastic and the company also. We visited many lovely places whilst we were there so Chez Sophie is a good base for sight seeing as well as being like home from home. Hopefully we will be back next year! Within the village there are local amenities including bakery, butcher, small shop, pharmacy, post office and general shopping.